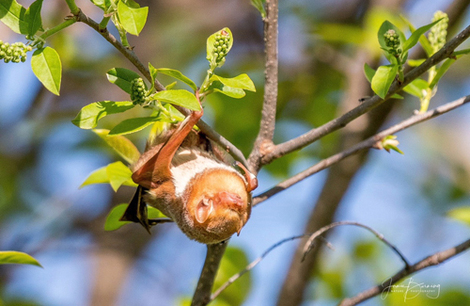 An eastern red bat rests on a tree at Montrose point bird sanctuary. Photo by Jamie Burning. There is an abundance of wildlife that depends on the Chicago River for food, shelter, and reproduction. As the quality of both the aquatic and riparian habitat improves, we can expect to see even more animals. When you walk along the river, keep your eyes open. The variety and location of wildlife can be surprising. Learn about Friends' projects to create habitat for bats and osprey. Mammals play important roles in the food webs of practically every ecosystem. They are herbivores, insectivores, carnivores and omnivores; and can be both predator or prey. Many terrestrial mammals still have close ties to rivers. 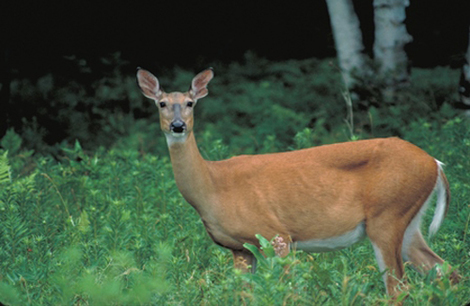 Herbivores such as mice, rabbits and deer are primary consumers, feeding on plant material and are eaten by numerous omnivores and carnivores. Omnivores such as moles, shrews, opossums, and raccoons feed on a wide variety of plant and animal matter. Carnivores such as foxes, coyotes, and bobcats feed on other animals and can be essential in the population control of other animals. A white-tailed deer, one of the common mammals in our forest preserves. The University of Illinois Extension has a complete guide to the mammals of Illinois, most of which can be seen along the river. Some common mammals are highlighted below. 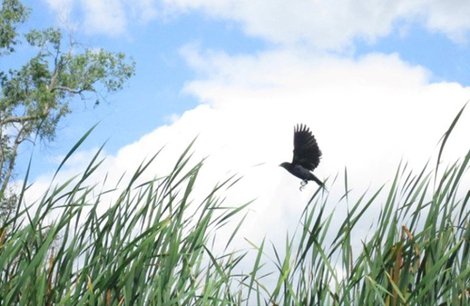 A red-winged blackbird defends its nest above the marsh. The Forest Preserves of Cook County has a bird checklist which includes almost 300 species found throughout the preserves, most of which can be spotted along the Chicago River, especially during migration. Audubon also has a guide to North American birds. Some common birds are highlighted below.